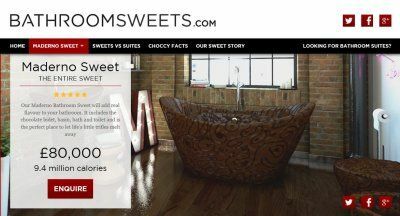 Bathrooms.com has been shortlisted for PR Week's Best Use of a Small Budget Award for a campaign created around chocolate bathrooms. The initiative was born out of the realisation that many people were incorrectly spelling bathroom 'suites', and typing 'sweets' into search engines. Collaborating with their PR agency Dynamo the team decided to create a bathroom suite made entirely of chocolate, and available to buy from Bathroomsweets.com. The results saw Bathrooms.com rise in keyword rankings for the term 'bathroom suites' which increased overall sales for the business. The shortlist for the PR Week awards has been whittled down from hundreds of submissions across 28 categories. Competing with Bathrooms.com in the nominations are Ladbrokes, Borough Market and Jo's Cervical Cancer Trust. The winners will be announced in October. Bathrooms.com CEO and founder Ian Monk said it was "very exciting to be nominated for a PR Week award, not to mention being shortlisted amongst some very reputable brands and causes".